The 2 Compartment Round Face Bin for Slatwall display opens doors to a variety of showcase potentials. 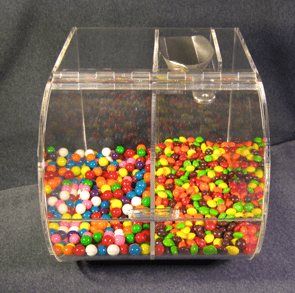 Offering two brightly colored items in this candy bin will bring customers in for more than just gazing. When they see this stunning acrylic display, they'll be rushing to make a purchase. This divided bin holds a whopping 10 to 12 pounds of candy. Imagine the smiles you will see when patrons see your colorful candy oasis. Bring your food profits and displays upward when you purchase this slatwall acrylic container.